Gets you started with Flex, an SDK for rich Internet applications, by walking you through three projects you can begin right away. Rich Internet Applications and Flex are taking off. Many developers need to learn Flex fast. That is why we wrote the book First Steps in Flex. We're giving you just the right information to get you started. This refcard highlights three useful chapters which help readers get started learning Flex. The first is a simple "Hello, World" application which will help familiarize readers with the Flex Builder tool and programming model. Secondly, we'll go into depth about how to connect Flex applications to back-end data through RESTful XML and SOAP. And lastly, "Remoting and Messaging with Java" walks through how to easily connect to a Java back-end with the open source BlazeDS product. First, download and install the 60-day free trial of Flex Builder from http://www.adobe.com/go/flex_trial. The easiest way to do this is to get the standalone installation (even if you already have Eclipse installed for some other purpose). There is also an Eclipse plugin if you are so inclined. Select File|New|Other. This brings up the "Select a wizard" dialog box. Select "Flex Project." This brings up the "New Flex Project" Dialog box. Type in a project name: helloWorld. Use the default location (which will already be checked). Select "Web application (runs in Flash Player)." Leave everything else alone and press "Finish." Your project will open in the MXML code editor. You will see the file titled helloWorld.mxml. Note that this is a valid XML file. This inserts a Label component into your Flex application, which should now look like the following. Flex Builder automatically puts in the first line that you see in the listing above; this is the doctype line which specifies that this is a standard XML file. However, Flex ignores this line when compiling the program and so it can be omitted. The name property in the Application tag is ignored by Flex; we use it to give the name of the file containing program. In this case, the full file name is helloWorld.mxml. Now run the application. Go to the Run menu and select "Run." This should launch your web browser and run the application within the browser. You'll see the words "Hello, world" in a field of blue. Note that "Hello, World" is in the upper left corner. Modify the Application tag by removing the layout="absolute" property and re-run the application. You'll see that "Hello, world" is now centered. The Application component in Flex as well as other components like Panel have a layout property. The valid values for layout are "absolute", "vertical", and "horizontal". This selects the container class which is used inside the component. If unspecified the "vertical" layout is used. The "absolute" layout utilizes the Canvas contains. In a Canvas components are positioned with x and y values or using constraints like top, bottom, left, right, horizontalCenter, verticalCenter. Setting these properties on non-absolutely positioned containers like VBox and HBox has no effect. The "vertical" layout utilizes the VBox container which positions its children in a vertical stack (top to bottom). The "horizontal" layout utilizes the HBox container which positions its children next to one another (left to right). MXML allows you to describe and configure components in a higher-level, declarative fashion. However, MXML is always translated into the (procedural) ActionScript language, which is then compiled into SWF bytecode to be executed by the Flash Virtual Machine (VM). The String object has an id property. The id is the name of the object, and is necessary so that other objects can talk to it. You'll use id a lot. Here, the id is message, and the Label component uses this id, but within curly braces. Curly braces have a special meaning, which is "bind to this other object." In this case, the text field in the Label object is fetched from the String object. That's data binding,the data in one object is bound to the data in another. Now we've added another component, a TextInput field. The Label's text field is bound to message.text, so when you modify the TextInput the label will automatically change. Under the covers, data binding generates fairly complex code in order to watch for changes and respond to them. But you don't have to think about this; all you need is the curly braces. This is one of many cases where Flex does a lot of work for you in order to keep your life simple. Switch to Design View: in the upper left corner you'll see a button that allows you to toggle between "source" and "design." Experiment by adding components to your layout by dragging and dropping them, then switch back to "source" view and notice that you've just added more MXML components. In "design" view, try configuring the components using the "Flex Properties" pane. Blogs are also a great way to continue learning about Flex. http://feeds.adobe.com has a Flex category which makes finding Flex blogs easy. Flex applications, whether in the browser or on the desktop, run on the client side. Thus, there are no special server-side components necessary when building Flex applications. However, most Flex applications get data from remote servers, make changes to that data and then submit those changes back to the server. Flex provides many ways to load and manipulate remote data. Most of these methods are simple and can work with any backend technology such as .Net, Java, Ruby, Python, PHP, etc.,as long as the back-end logic is exposed through some kind of web service. Web services is a broad term which can mean SOAP, RESTful, JSON, XML-RPC, and more. Flex can easily connect to any of these web services. The HTTPService url property is set to the URL of the file we are requesting. After the application has finished initializing, the applicationComplete event is dispatched, which goes to the event handler of the same name, which calls srv.send(). The meaning of "send" here is "send the request to the server." You can send request parameters as arguments to the send() method. The DataGrid displays the results of the request by binding to srv.lastResult, which is dynamically set when the response comes back from the server. By default the srv.lastResult comes back as objects, which the HTTPService automatically converts from XML. What does this mean? Each XML node becomes an object, which contains other objects. If a node contains multiple subnodes, you end up with an array. If a node is just names and properties, thenthat node becomes an Object with corresponding keys and values. This algorithm repeats to the depth of your XML tree. You can also set the HTTPService resultFormat property to "e4x" in which case the results will be kept as native XML objects for use in E4X expressions. Or you can set resultFormat to "text" which allows for custom deserializers like JSON. Note that the DataGrid isn't configured with a dataProvider. Instead, this happens in the result event handler, which is written as a script block. HTTPService also has a fault event for requests that return errors. If you get an error when running this program, close all instances of your browser and try again. For an explanation, refer to the following Networking Limitations section. SOAP defines operations that are specified by its WSDL (Web Services Description Language). Once we set the wsdl property of the WebService to the remote WSDL URL, those operations can be called on the WebService object as if they were native methods of that object (this is one of the many benefits of using a dynamic language). Here, the call to the WebService method GetInfoByZip() takes a single parameter. The result event handler puts the data returned from the request into the DataGrid. Data binding can also be used with the results of the request by binding to the srv.GetInfoByZIP.lastResult.NewDataSet.Table property. The browser imposes several limitations on the networking capabilities of the Flash Player. The primary limitation is that applications running in the Flash Player can only make requests back to the server from which the application originated. Use a proxy server on the server from which the application originated from. Any server can act as a proxy. Apache is easy to configure as a proxy, as is the open source BlazeDS server (a subset of the LiveCycle Data Services product). Another limitation of the networking capabilities of Flash Player is that non-200 HTTP response codes cannot be accessed in the Flash Player. This is due to limitations in the browsers' Plug-in networking APIs. Either insure that all responses from your server are 200, or utilize a proxy. The Web Services examples showed how Flex applications can easily communicate with back-end servers through various web services protocols. Those servers can be running Java, ColdFusion, .Net, PHP, Ruby or any number of other serverside technologies. While web services are an easy way to communicate between Flex applications and servers, other options exist which can dramatically increase application performance as well as developer productivity. Every server technology can easily speak XML since it is a textbased protocol. XML is perfect when protocol transparency is necessary. For instance, Flickr's web services use RESTful-style XML over HTTP. This allows any developer using any technology to easily interact with Flickr by sending text-based requests. Flickr then responds with simple XML. One downside to text-based protocols like XML is that the additional layer of data abstraction is usually cumbersome to write and maintain. In addition, this data abstraction layer consumes resources on the server- and client-side when the data is serialized and deserialized. For some time, Flash Player has supported a transport protocol that alleviates the bottlenecks of text-based protocols and provides a simpler way to communicate with servers. Called Action Message Format (AMF), this binary protocol for exchanging data can be used over HTTP in place of text-based protocols that transmit XML. Applications using AMF can eliminate an unnecessary data abstraction layer and communicate more efficiently with servers. To see a demonstration of the performance advantages of AMF, look at the Census RIA Benchmark at http://www.jamesward.org/census. The open source BlazeDS project includes a Java implementation of AMF which is used for remotely communicating with serverside Java objects as well as for passing messages between clients. BlazeDS remoting technology allows developers to easily call methods on Plain old Java objects (POJOs), Spring services, or EJBs. Developers can use the messaging system to easily send messages from the client to the server or from the server to client. BlazeDS can also be linked to other messaging systems such as JMS or ActiveMQ. Because the remoting and messaging technologies use AMF over HTTP they gain the performance benefits of AMF as well as the simplicity of fewer data abstraction layers. BlazeDS works with a wide range of Java-based application servers, including Tomcat, WebSphere, WebLogic, JBoss, and ColdFusion. In addition, BlazeDS can be easily used in Flex applications for the web (running in the Flash Player) and the desktop (running in Adobe AIR).To get started, simply deploy the blazeds-samples.war file in any servlet container. This web application contains a number of preconfigured sample applications that can be accessed at http://localhost:8080/ blazers-samples (The port may vary depending on your application server and configuration). The Flex Builder 3 plugin for Eclipse, from http://www.adobe.com (For building this example, you must use the plugin rather than the standalone Flex Builder installation). Start Eclipse + Flex Builder. Add the src directory to the build path. Use the WEB-INF/classes directory as the output folder. For the project name, type testHelloWorld. Select "J2EE" as the Application Server Type. Select "Use remote object access service" and LiveCycle Data Services. Specify the Root folder to be the location of your deployed WAR file. Specify the Root URL to be http://localhost:8080/blazeds (Your port name may be different depending on your application server and configuration). Specify the Context Root to be: /blazeds. Verify the configuration and click "Finish." Run the application and test it by typing your name into the TextInput box. You should see "hello, <your name>" displayed beneath the TextInput. The Flex application uses the RemoteObject library to communicate with the BlazeDS-enabled server. When the user enters text in the TextInput box, the change event causes the RemoteObject to make a request to the server. The server then makes a request to the Java Class specified in the remoting destination configuration. This could call a Spring service or EJB session bean, but this example just calls a POJO. The POJO's return value is simply "hello," with the name argument appended. When the POJO returns a value, that value is serialized into AMF and returned to the Flex application. The RemoteObject library then sets the ro.<method name>.lastResult property to the value that was returned. (In this case ro.sayHello.lastResult.) The result can also be obtained through a result event on the RemoteObject. Data binding triggers the Label to display the result. BlazeDS also supports passing typed Java objects back and forth. Let's build an application that uses the BlazeDS messaging system. A messaging destination allows the messaging system to relay messages to clients listening on that destination, and it allows messages to be sent to the destination. Messaging destinations can have durability and network parameters, and they can also be connected to other messaging systems like JMS. For the project name, type testChat. Specify the Root folder to be to location of your deployed WAR file. e. Specify the Root URL to be http://localhost:8080/blazeds (Your port name may be different depending on your application server configuration). f. Specify the Context Root to be: /blazeds. Run the application. Enter a message in the lower TextInput box and click "Send." Verify that the message is displayed in the upper box. Also notice that messaging works across multiple browser windows. When the user clicks the "Send" button, a new message is created using an anonymous object to set the msg property on the body of the message to the value in the TextInput. Because the message type is an AsyncMessage, that class must be imported. The Consumer object allows Flex applications to listen for messages. When the application has initialized, it subscribes to the message system. Then, when a message is received, the event handler on the Consumer takes the chat message out of the body of the message and appends it to the TextArea. The Producer object allows Flex applications to send messages into the message system. There is also a Java API (not used in this example) which allows messages to be sent into the message system on the server. With a custom adapter or the out-of-the-box JMS adapter you can connect the message system to other messaging systems, but by default the message system runs standalone. Rich Internet Applications and Flex are taking off. Many developers need to learn Flex fast. That is why we wrote the book First Steps in Flex. We're giving you just the right information to get you started. 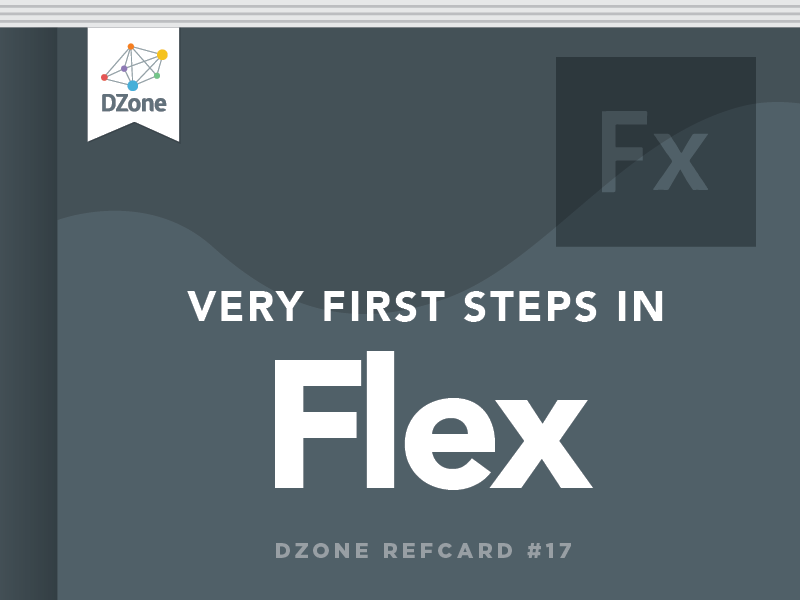 This refcard highlights three useful chapters which help readers get started learning Flex. The first is a simple \"Hello, World\" application which will help familiarize readers with the Flex Builder tool and programming model. Secondly, we'll go into depth about how to connect Flex applications to back-end data through RESTful XML and SOAP. And lastly, \"Remoting and Messaging with Java\" walks through how to easily connect to a Java back-end with the open source BlazeDS product. Select File|New|Other. This brings up the \"Select a wizard\" dialog box. Select \"Flex Project.\" This brings up the \"New Flex Project\" Dialog box. Select \"Web application (runs in Flash Player).\"
Leave everything else alone and press \"Finish.\"
Now run the application. Go to the Run menu and select \"Run.\" This should launch your web browser and run the application within the browser. You'll see the words \"Hello, world\" in a field of blue. Note that \"Hello, World\" is in the upper left corner. Modify the Application tag by removing the layout=\"absolute\" property and re-run the application. You'll see that \"Hello, world\" is now centered. The Application component in Flex as well as other components like Panel have a layout property. The valid values for layout are \"absolute\", \"vertical\", and \"horizontal\". This selects the container class which is used inside the component. If unspecified the \"vertical\" layout is used. The \"absolute\" layout utilizes the Canvas contains. In a Canvas components are positioned with x and y values or using constraints like top, bottom, left, right, horizontalCenter, verticalCenter. Setting these properties on non-absolutely positioned containers like VBox and HBox has no effect. The \"vertical\" layout utilizes the VBox container which positions its children in a vertical stack (top to bottom). The \"horizontal\" layout utilizes the HBox container which positions its children next to one another (left to right). Here, the id is message, and the Label component uses this id, but within curly braces. Curly braces have a special meaning, which is \"bind to this other object.\" In this case, the text field in the Label object is fetched from the String object. That's data binding,the data in one object is bound to the data in another. Switch to Design View: in the upper left corner you'll see a button that allows you to toggle between \"source\" and \"design.\" Experiment by adding components to your layout by dragging and dropping them, then switch back to \"source\" view and notice that you've just added more MXML components. In \"design\" view, try configuring the components using the \"Flex Properties\" pane. The HTTPService url property is set to the URL of the file we are requesting. After the application has finished initializing, the applicationComplete event is dispatched, which goes to the event handler of the same name, which calls srv.send(). The meaning of \"send\" here is \"send the request to the server.\" You can send request parameters as arguments to the send() method. You can also set the HTTPService resultFormat property to \"e4x\" in which case the results will be kept as native XML objects for use in E4X expressions. Or you can set resultFormat to \"text\" which allows for custom deserializers like JSON. Select \"J2EE\" as the Application Server Type. Select \"Use remote object access service\" and LiveCycle Data Services. Verify the configuration and click \"Finish.\"
Run the application and test it by typing your name into the TextInput box. You should see \"hello, <your name>\" displayed beneath the TextInput. The Flex application uses the RemoteObject library to communicate with the BlazeDS-enabled server. When the user enters text in the TextInput box, the change event causes the RemoteObject to make a request to the server. The server then makes a request to the Java Class specified in the remoting destination configuration. This could call a Spring service or EJB session bean, but this example just calls a POJO. The POJO's return value is simply \"hello,\" with the name argument appended. Run the application. Enter a message in the lower TextInput box and click \"Send.\" Verify that the message is displayed in the upper box. Also notice that messaging works across multiple browser windows. When the user clicks the \"Send\" button, a new message is created using an anonymous object to set the msg property on the body of the message to the value in the TextInput. Because the message type is an AsyncMessage, that class must be imported.